To be born again, one needs to die, and to dive deep into the dead sea, one needs to spark a controversy, and to spark that topic which can be controversial, one needs to take on something which is beneficial to someone, that something or someone has to be rigid and inflexible and stubborn, so something’s happened as I headed to the JLF in the Pink City that is my very own. O, their shoes, if not Japanese, were at least made up of posh Italian leather and with time they didn’t weather, hoji these English trousers you see were wrinkled and still wrinkle free, their hats if not for USSR or any country included in that, were certainly showing to their class still after being poshly poshest posh the what, the gentry at the festival reminded everything in actuality we are not. The kids with heavy cams, the writers and authors with interesting names, the aunties with big round bindis and open hair certainly oozed the intellect with the smoke they were puffing, the French bearded literature class with heavy eyelids showed the scholarly text, they were snuffing. And the girls there were simple voila, why to comment over them, some of them were 9.6 and others were 10 on 10. As it is not usually written in the preface of the book that it is banned in certain countries so I downloaded and read, where freedom of expression and speech is not as free as it seems, the democracy we live in is subject to certain communities to please and appease, secularism is a joke for the banks where they secure plenty of votes. The book may have its spine, but the Government lacks one, neither have they crossed or let anyone else cross the dreaded line and that in the end turned out to be fine. The show was actually going on fine as no one who were actually present in JLF were actually bothered about Salman Rushdie abstaining against his own will. The thoughts and intellect which was flowing in the air was totally healthy and not at all ill. The colors and the speakers at JLF were just beautiful. The crowd, a good mix of photogenic youth and intellectual veterans, was busy hustling bustling to get better view/seats in the tents and marquees. The sessions happening were full of knowledge and opinions, some of them were given by people we love and some we fake love like we cry while cutting onions. This year’s Lit fest might not have helped The Diggi Palace actually, since it was getting difficult to hold the crowd there, it might be moved to somewhere else or some restriction on entry might be applied, as it is much needed critically. The basic show got overshadowed by a not so required set of events, but time to time, things should happen to reveal the no-so-clear motives of our beloved governments. P.S. 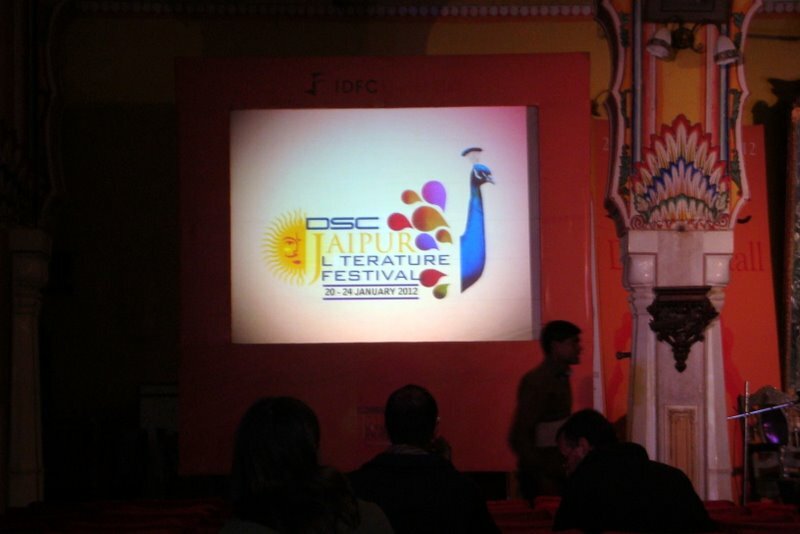 : This is my account of JLF and the controversies hovering over it. The language of the post evident somewhere and somewhere not is what I got from the banned book itself. I tried reading it but after 2 pages, I realized that it requires intellect of some other kind. And also it is banned so why bother. Meanwhile, below is a glimpse of how things looked there. Keep reading.